In addition to the full production capabilities of Admiral Video’s NLT-36 HD Production Truck, we also are able to offer on-site engineering and technical support to outside remote productions. 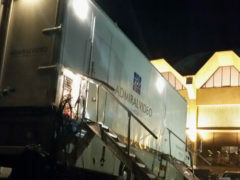 Recently NLT-36 traveled to West Virginia University to support a major network’s remote production of an NCAA Men’s Basketball game. 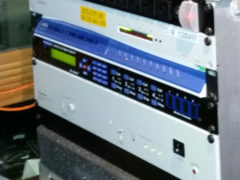 We provided seven cameras and six effects mics which were discretely uplinked to the network’s production facilities, where they provided switching, graphics, replay, and audio mixing for the final program feed. Program video and audio and camera tally signals were returned back to the remote site. We also integrated six remote PLs with our intercom system and provided local keypanels and beltpacks for on-site personnel. In addition to traditional phone lines and TIFs, an external RVON-I/O interface and VoIP system offered redundancy (and added complexity!) to the communications system. We were also able to accommodate the last-minute addition of a local sideline reporter and a local producer, providing an additional mic send and facilitating a return mix-minus IFB feed with local interrupt. With larger-scale remote productions becoming commonplace, Admiral Video is proud to be able to meet the demands for flexibility and adaptability that virtually any production requires. © 2019 Admiral Video, LLC. All rights reserved.